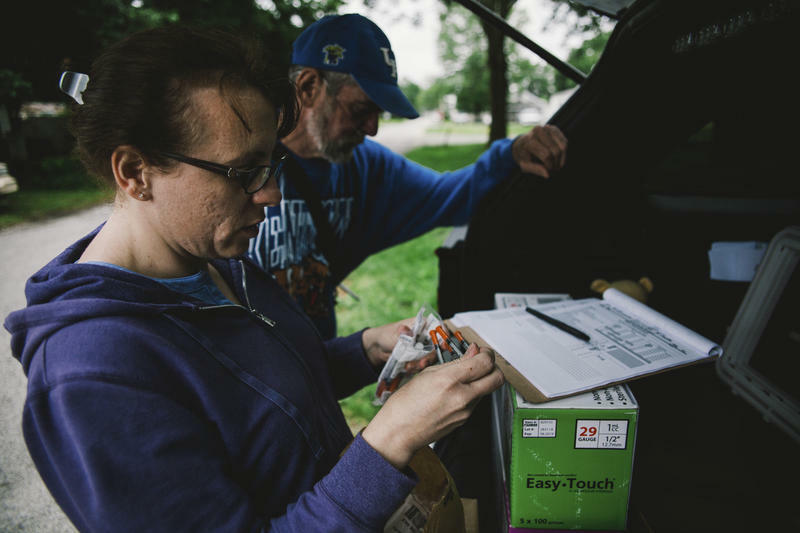 The Scott County Health Department's Brittany Combs makes a weekly stop with the county's syringe exchange program's mobile unit in Austin, Indiana. A state law means such programs must be renewed every two years at the most. On a recent morning in downtown Tippecanoe County Indiana, a standing-room-only crowd showed up for a county commissioners meeting. The issue at hand? Renewing the county’s syringe exchange program. Testimony from public health officials and other supporters filled close to two hours of the meeting. Half a dozen white-coated graduate students from the Purdue University College of Pharmacy testified in support, saying the program can stop the spread of disease. From the other end of the political spectrum came a mother, visibly upset. She gave her testimony wearing her child around her body in a harness. After her testimony, resident after resident continued to step up to the podium to give their opinions in their allotted three-minutes. Debates such as this have played out in several Indiana counties. Public health experts and worried community members go head-to-head on the issues of syringe exchanges and politicians try to skate through a heated debate without antagonizing constituents. In 2015, Indiana legalized syringe exchange programs to prevent spread of HIV and hepatitis C. Yet unlike other states, which let programs continue indefinitely, Indiana requires county governments to re-approve them every two years at most to remain in operation, a provision advocates say put the programs — and the people they help — at risk. Syringe exchange programs are one of the most visible forms of harm reduction, an approach that strives to minimize drug use’s negative effects rather than punish people for using. Many years of research has shown they reduce rates of disease by keeping people from sharing and re-using infected needles and other tools. After injection drug use fueled a historic HIV outbreak in Scott County, Indiana, the state changed its laws to allow counties to implement syringe exchange programs. Earlier this year, nine Indiana counties had established syringe exchange programs, which are also called needle exchanges or syringe services programs. 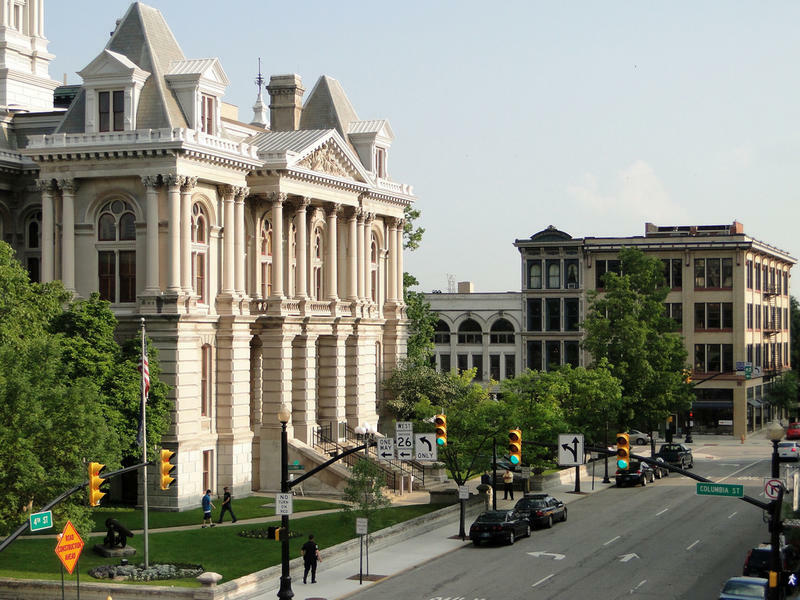 The Tippecanoe commissioners eventually decided to extend the county’s program. But two others — in Madison and Lawrence Counties — were shut down after governments cast a “no” vote earlier this year. It’s a trend that troubles many public health researchers and advocates. It’s not hard to understand the initial shock some residents feel when they hear what happens in a needle exchange. People actively using drugs get free supplies for their habit, such as needles, cottons, water and even “cookers” — little tin dishes for melting down drugs into water prior to injecting. But all the equipment has a purpose: without it, people could keep using paraphernalia that's infected with life-threatening diseases. Abert has been working with addicted people since before the 2015 law was passed. He still operates the Monroe County exchange, which operates both out of its cozy office (its wall stacked high with lime-green boxes of syringes) and a mobile unit. On the job, Abert makes small talk with the participants. He asks them where they’re living, how they’re feeling. He dresses casually for the mobile unit — in a black sweatshirt and a hat pulled over his eyes. He makes it clear he’s a friend. Abert’s chill attitude immediately seems to calm people down. One woman, who came in cursing at someone outside the van, relaxed once she picked up menstrual pads from a shelf in the truck (part of the Alliance’s new “We Love You. Period.” program). Abert asked if she wanted to learn how to use naloxone. “Do you have time? I need your full attention,” he told her, holding the millennial-pink box. Usually naloxone training involves fixing a mister to a syringe, which sprays the life-saving substance into a person’s nose. Abert doesn’t bother with this step. After the woman agrees to the tutorial, he teaches her to inject the naloxone directly into muscle, the fastest way to administer the drug. The people who come to visit know how to use a syringe. Before Scott County set up its program in 2015, the rural county was seeing 10-20 new HIV cases every week. Almost immediately after, the number of new cases was slowed to 1-2 a month. Even so Scott County has to periodically vote to keep its program running. Abert said the renewing process puts the harm-reduction initiatives at risk. “I mean honestly, the law is flawed,” he said. “The problem lies more in the way Indiana structured the re-approval procedure … syringe service programs and harm reduction are best suited to be proactive and to prevent an outbreak.” When they’re always at risk at being shut down, they can’t do that. The rule that requires counties to perpetually re-authorize isn’t the norm in other states, said the Harm Reduction Coalition’s Policy Director Daniel Raymond, who can’t think of another with such a requirement. Even other states with newly-established syringe exchange laws such as North Carolina and Kentucky don’t ask counties to reauthorize. Indiana’s different. The state was rushed into the decision to legalize exchanges because of the Scott County emergency. Raymond said the state included the renewal provision to please more conservative legislators. He agrees with Abert — programs need consistent political support. “Programs that are going to succeed in Indiana are ones that are willing to make that long-term commitment,” he said. Raymond said other states that had renewal laws (such as California) eventually abandoned them. Time, he said, plays a big role in a state’s opinion on harm-reduction. And, he says, even former governor Mike Pence — who initially opposed syringe exchange on moral grounds — changed his mind in the end. 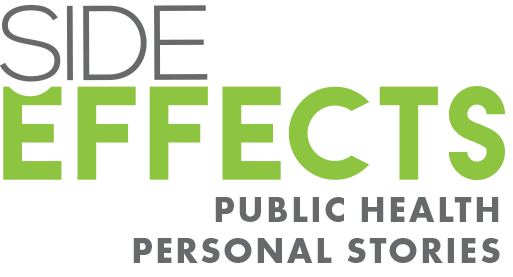 This story was produced by Side Effects Public Media, a reporting collaborative focused on public health. Reporter's note: This story has been updated to correct an error about naloxone. It's injected into muscle, not a vein, as originally written. The opioid addiction crisis is getting worse, and it's often reported on in desperate terms. But to the people working on the front lines of the problem, there are known and proven approaches that can help. This series introduces you to these people and how they're tackling the issue in their communities — with hope, compassion and strength. 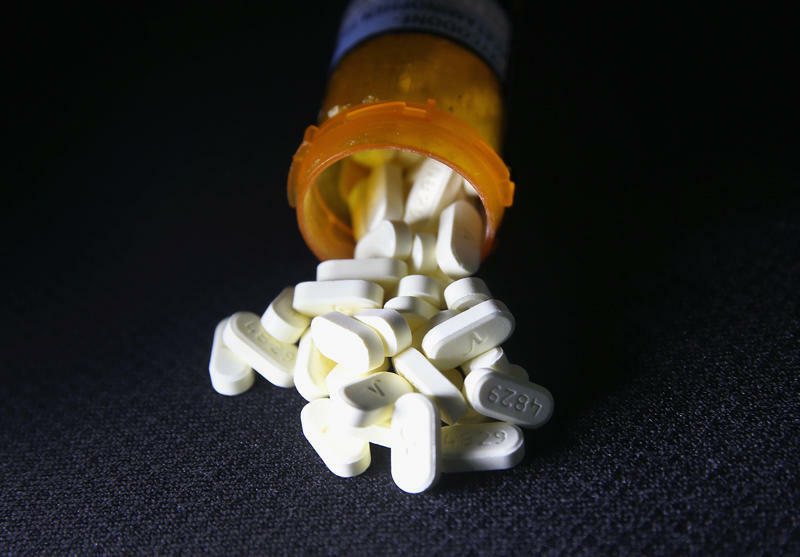 Life expectancy in the U.S. fell for the second year in a row in 2016, nudged down again by a surge in fatal opioid overdoses, federal officials report Thursday. "I'm not prone to dramatic statements," says Robert Anderson, chief of the mortality statistics branch at the National Center for Health Statistics. "But I think we should be really alarmed. The drug overdose problem is a public health problem, and it needs to be addressed. We need to get a handle on it." By the slimmest of margins, Tippecanoe County, Indiana’s embattled needle exchange program will survive for at least one more year.